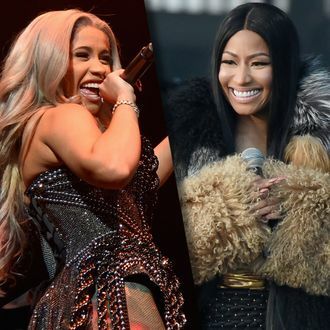 Cute couples costume idea: Nicki Minaj and Cardi B taking over Migos’s new track “Motor Sports.” The boys invited rap’s reigning queens to join their newest single, and the ladies brought a cornucopia of one-liners. Consider, courtesy of Cardi, a praise to the most high, Selena Quintanilla-Pérez: “So tell me, have you seen her? Let me wrap my weave up / I’m the trap Selena / Dame más gasolina.” And then, from Nicki, who switches up her flow four! separate! times! during her verse: “All of your friends’ll be dead, you can get hit with that Uzi / I call him Ricky, he say he love me like Lucy.” Can you even hear Migos’s contribution over the squeals Nicki elicits? “Motor Sport” is the first song from Migos’s forthcoming Culture II. Keep this one on repeat until Nicki Minaj returneth.